Seth Meyers does an audience walkthrough. 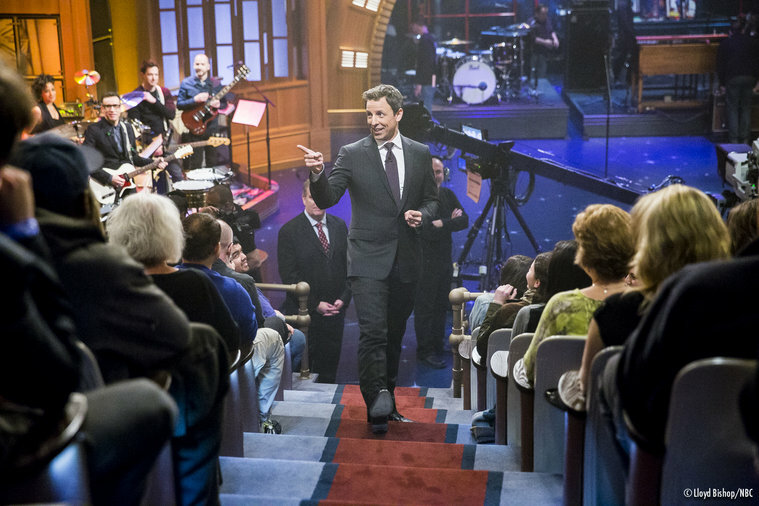 With Late Night with Seth Meyers, Seth Meyers becomes the latest member of the late night fraternity. He is Late Night‘s 4th (and oldest*) starting host, following in the footsteps of David Letterman, Conan O’Brien, and Jimmy Fallon. In a sign of the competitiveness of the late night daypart, all of his predecessors had their own shows when Meyers’ version premiered. Seth Meyers improv career started with Northwestern University’s improv group, Mee-Ow, and Boom Chicago, a traveling improv group based in Amsterdam. He was at Saturday Night Live from 2001 to 2014, where he starred as performer, writer, and the longest serving anchor of Weekend Update. His successes there led Executive Producer Lorne Michaels to recommend Meyers take over for Fallon at Late Night; NBC couldn’t agree more. As the newest host of NBC’s 12:35 am Late Night franchise, Meyers has big shoes to fill. Although Fallon’s reign at Late Night was short, NBC thought him talented enough to take The Tonight Show after only five years. Despite Meyers being a natural worrier, many see him as an obvious choice, selecting him over the likes of Chelsea Handler and Howard Stern. Late Night with Seth Meyers premiered February 24, 2014. For its opening weeks the show ran five nights/week, but after which will run Monday through Thursday, as per its norm. Fred Armisen, another SNL alum, is its bandleader.